Appreciate the collections at Seurasaari Island and Open-Air Museum and Jarvenpaan Taidemuseo. You'll discover tucked-away gems like Linden Esplanade and Hakaniemi Market. 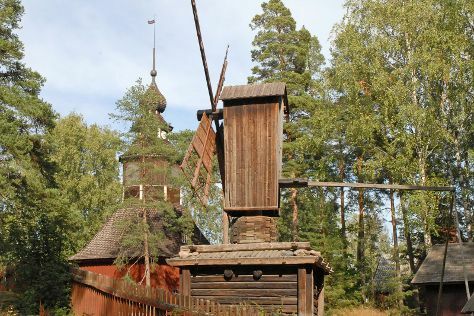 Get out of town with these interesting Helsinki side-trips: Parola Tank Museum (in Parola), Bellevue Beach (in Hanko) and Kotka (St. Nicholas Orthodox Church & Beach Mansikkalahti). There's much more to do: wander the streets of Ullanlinna, get a taste of the local shopping with Galerie Anhava, stop by Okra, and take in the exciting artwork at Galleria Lapinlahti. To see more things to do, photos, ratings, and more tourist information, read our Helsinki tour itinerary builder tool . If you are flying in from Hungary, the closest major airport is Helsinki Vantaa Airport. In April, plan for daily highs up to 9°C, and evening lows to 0°C. Finish up your sightseeing early on the 28th (Sun) so you can travel back home.